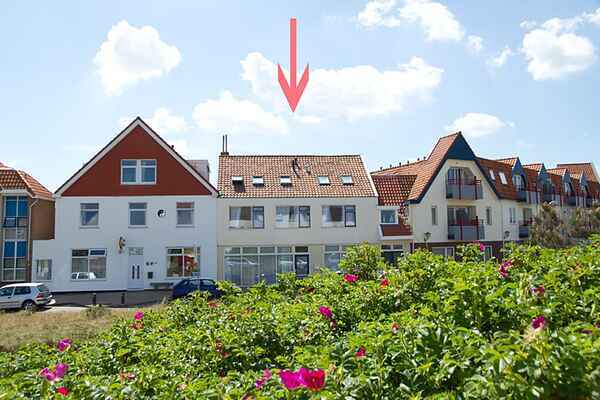 This lovely holiday home in Bergen aan Zee consists of two apartments suitable for 18 people in total, and is located just 100 metres from the beautiful beach of Bergen aan Zee. The apartments have a pleasant feel to them, thanks to the large amount of natural light that comes in through the many windows. The living room and kitchen are attractive and lovely places to spend your holiday. Enjoy the nice weather on your balcony. The holiday home is in an ideal location. The nice beach of Bergen aan Zee is only 100 metres away. This is a great place to enjoy the sun, cool down in the North Sea, have a drink and a bite to eat at one of the beach cafes or go for a long walk along the beach. The apartment is located in the middle of the town centre, where you can get all your groceries and find some interesting shops. And remember to visit the typical Dutch city of cheese: Alkmaar! If you rent the entire house, you're entitled to four resident's parking permits, allowing you to park for free during the entire day. There are also three visitor's permits (each valid for 4 hours) that you can make use of. Paid parking between 1 March and 1 November from 10 a.m. until 7 p.m. If you need a day permit for any additional cars, this can be purchased at the parking ticket machine for € 12 (subject to change). There's plenty of space for a pushchair and/or a wheelchair in the hall/entrance.